This collection of UFO reports from pilots, astronauts, and other government officials will prove to you that UFOs are not only real, but have been here for a long time. Take an in-depth look at the US Government's reactions to UFO phenomena since 1947. Find out what happens when military aircraft fire upon a UFO and whether these aircraft are a threat to our National security. 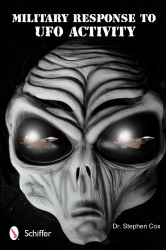 Be there with military and civilian pilots, military personnel, and others who have had encounters with UFOs. weapons being developed to fight aliens. Approach the threshold of the unknown. It's time you learned the truth about UFOs.